Make the perfect speech or amaze the crowd at your next karaoke party! Business meetings. The Best Man’s speech. Coffeehouse stardom. Karaoke/open-mic performances. The 12-year-old future Superstar. There are a surprisingly large number of events in life that need a high-quality microphone for public address or recording duties. You have a nice powered speaker or sound system—now you just need to add a quality microphone, complete with an adjustable stand and connection cable. 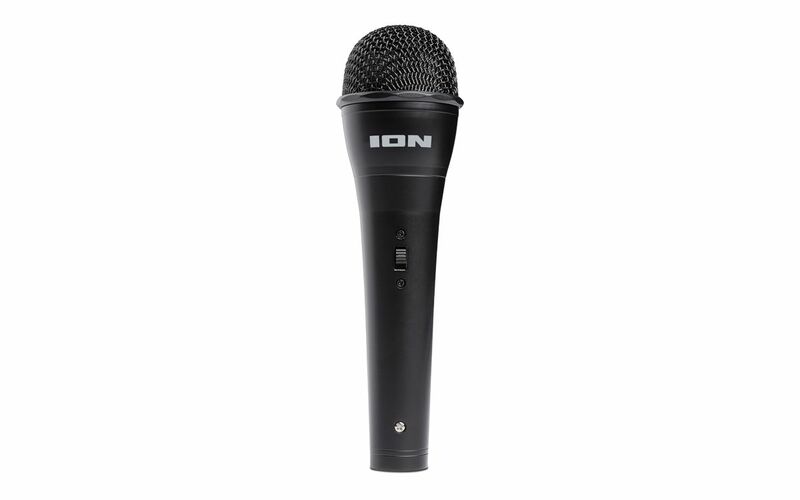 The ION Mic and Stand is a high-quality microphone that gives you a great, easy-to-use mic with its own adjustable stand, perfect for those situations where you need to keep your hands free. Boasting a rugged metal housing and on-off switch, the Mic has a wide range 60-14kHz frequency response, which means your voice comes through with amazing clarity and realism. With a 10-foot (3m) XLR connection cable and ¼-inch jack, the Mic is compatible with virtually every standard sound system available. For your convenience, the stand’s tripod feet fold up, making transport a snap.